California based Pathway LLC, partnered with Levitate Technologies wins golden manus from nearly 550 applicants worldwide. At the 2017 Hannover Messe, plastic bearings expert igus announced the winners of its 8th manus awards for unique plastic bearing applications. 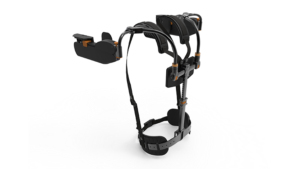 An independent jury, with representatives from the research, business, and specialist media organization, awarded the 2017 golden manus trophy, along with a €5,000 prize to California based Pathway LLC for its design for manufacturing of the Airframe exoskeleton, developed by Levitate Technologies Inc. There are many developments continuing in exoskeletons, beyond worker productivity it includes helping paraplegics walk again. Click here to learn about the various advancements we are seeing. The French company, Ocean Innovation System, was awarded the silver manus for their electric manipulator arm, which can be used in salt or fresh water at depths up to 1640ft, or 500m. The gripping arm utilizes more than 30 iglide plastic bearings, including those made from the iglide T500 material, which is able to withstand very high loads and possesses very low rates of moisture absorption. The arm, while in the extended state, has a dynamic load-bearing capacity of 35 lb (16kg), or 110 lb (50kg) while static. German student researchers claimed the bronze manus for 2017 with their UB-SPACE project, which analyzes how objects move in space. The system was deployed on the sounding rocket REXUS 21 in March of 2017. The 5-man research team developed a module which transports a so-called “free falling unit,” or FFU into space in order to record how the FFU moves using a systems of a camera and sensors, mounted to the wall of the rocket wall using a 3D printed iglide bearing. Additionally, the ejection chute where the FFU is release is lined with iglide V400 low-friction tribo tape.